I have to write this book out of my system - or, at least, try to. Not because it was horrible. No, rather because it was spell-binding and captivating. Even still, I don't think writing about it is going to make the memory of it fade. It's a spectacular read and I adored it. As regular readers know, I love picking up books at our local Goodwill. Normally though I stick to buying books I am familiar with or know that we'll like. However, I saw The Kitchen Boy: A Novel of the Last Tsar and snatched it up, instantly tossing it into the cart. A safe bet? Most certainly! I think the Romanov family story is a fascinating (and, indeed, horrifying) one. So many mysteries surrounding the last Tsar of Russia and his family have flooded the media, movie, stories and imaginations of the general public. Due to the fact that two of the Tsar's children's bodies were not found with the rest of the family when they were discovered in 1979 by an amateur archaeologist, there is a great deal of speculation as to what might have become of the missing two. It wasn't until 1998 that the bodies found in 1979 were confirmed as being those of the Tsar, the Tsarista and three of their daughters and it was still later that the mystery of the final two children was laid to rest. But again, the fact that two of their children's bodies were missing sparked great speculation as to what happened to their fourth daughter, as well as their son and heir. 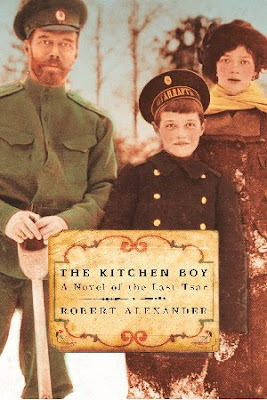 The Kitchen Boy: A Novel of the Last Tsar is obviously a very well-researched story, using fiction to tie together pieces of fact. It focuses on the time period wherein the Romanov family were being held in the "House of Purpose" in Yekaterinburg in Siberia. The story revolves around the kitchen boy who the Tsarista mentioned in one of her final notes who had been removed from the house the evening of their murders. Author Robert Alexander, while reading about the Romanov family, honed in on the two lines about the kitchen boy and created this "What if?" story which might answer some of the mysteries about the family's last weeks, hours, execution and what might have happened to the heir and Grand Duchess whose bodies were not with the others. This book could easily be spoiled so I'm going to tread lightly from here on out. Let's just say this book is RIVETING. (Yes, I have to use all caps.) I started it one afternoon during the boy's nap time and was ripping my way along in spare moments throughout the rest of the day. I was three chapters away from the end (at 10:30 p.m.) when Jonathan suggested it might be time to go to sleep. All I could do was will myself not to think about the story as I drifted off for the night. The next morning I made my breakfast and sat down with the book and finished it. Oh my. Oh my, oh my, oh my!!! After completing the book, I spent a good bit of time browsing around online to learn more about the Tsar and his family. Yes, The Kitchen Boy is fiction. But there is a great deal of fact included. Alexander included actual notes, correspondence, diary entries and plenty of known facts to tell his story and it is captivating. History is incredible sometimes. I love it when authors skillfully bring it back to life so that we can learn more about it. The more we learn about the past, the better we will approach the future. Can't think of any other ways to goad you into reading this, so just hoping you'll give it a chance. I am so glad I did! I think this will rank as one of my top favorite reads of 2011. It was that powerful. You make books that I wouldn't think to pick up sound so captivating! Never heard of this one - thanks for the review! OK, I'll read it! I love good historical fiction and nonfiction both. I'm sure I'll like this one as much as you did. ooooh, sounds fascinating!! I'm in the market for a book that just takes me away. "Riveting" sounds like just the adjective I'm looking for! :) Sure wish there were more hours in the day. . . I read this book and loved it. I picked up the second book on a clearance rack but have yet to read it. I think he wrote two more books that follow this one. (Although, I think the KB would be hard to beat.) Are you going to read them? I loved this book, and literally went on a Romanov reading binge (better than drugs, I suspect). I couldn't get enough of this story or family. And it's still hard for me to pass up anything Russian Revolutionary. Melissa - I'm Romanov-ing myself on Netflix right now. =D I don't know exactly what it is that makes their story so very compelling but there's definitely something to it! I love 20th century European history and get a little nostalgic thinking about the time I spent teaching high school world history. I LOVED teaching the Russian Revolution. I have to agree with the first commenter when she said, "You make books that I wouldn't think to pick up sound so captivating!" But I seriously think you will all LIKE it! I actually got to see the large Russian 'Nicholas and Alexander Museum' when it came to the States...we happened to be in Mobile at the right time. IT WAS AMAZING! I just finished this yesterday (also read in 2 days - children had to entertain themselves while I turned pages)and am obsessed! I can't get the links to the author's website to work, have you been able to? I was curious to see what pictures he included and if the one on the cover is real? Thought I was years behind on discovering this one (picked it up by accident on the discount shelf), so it's fun to see you just read it too! I just finished reading this book last night. It has been on my TBR list for a while after you recommended it. I loved this book!